… Yeah, I got nothin’. On Tuesday’s menu is crackers and cheese and ham. I decided to spice it up a little bit by rolling ham and turkey around each other, slicing and using cheese cubes to make skewers. Jaiden & Jaylen also have their crackers, cherries, an orange with a star cut out (to help them peel it) and a few cookies. Hopefully they like it. 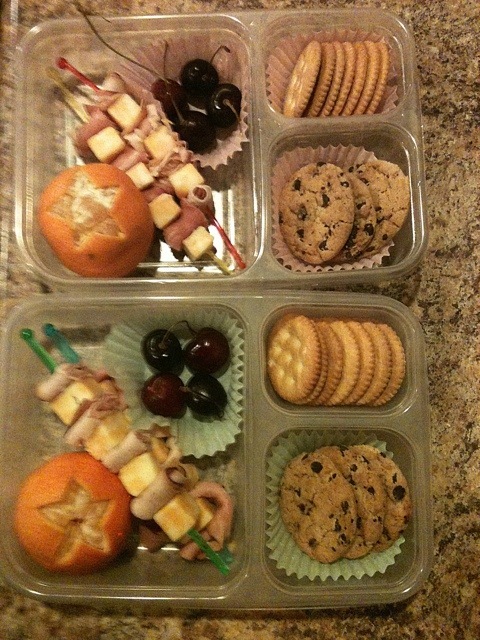 Monday’s meals were a little bit of a bust: Jaiden complained about not having ranch to dip her carrots, Jaylen complained that the cucumbers kept falling out of his dinosaurs and that he didn’t like the graham cereal and Emma didn’t like her grapes, the bread or the sharp cheddar cheese in her sandwich. Le sigh. You say you got nothin’, but my son really, really wants me to do this lunch for him. 🙂 He would gobble up all those foods. The star on the orange is great to help little hands open it up.